Then We Came to the End by Joshua Ferris. Little Brown, 2007, 400 pages. Trouble by Gary D. Schmidt. Clarion, 2008, 297 pages. intro to a sad, weird man. J. Edgar Hoover: A Graphic Biography by Rick Geary and Andrew Helfer. Hill & Wang, 2008, 102 pages. How to Steal a Dog by Barbara O'Connor. FSG, 2007, 176 pages. must learn to step the [bleep] off. Certain Girls by Jennifer Weiner. Atria, 2008, 400 pages. learns the power of the pen. Clementine's Letter by Sara Pennypacker. Hyperion, 2008, 150 pages. So, uh, last week kinda sucked. On Sunday I had my recital (which was awesome; no suckage); Monday I took the Boy in for tubes surgery (went well; he is chipper and infection-free but still speaks no English); Wednesday we found out Chloe was dying (sucked); Friday we put her down (SUCKED). And now today's my birthday! Yeah . . . I won't tell you how old I am, but if I make it through this year I will be Older Than Jesus. 3. At the end of the post, the player then tags five people and posts their names, then goes to their blogs and leaves them a comment, letting them know they've been tagged and asking them to read the player's blog. 4. Let the person who tagged you know when you've posted your answer. Working at my current job (same place, lesser title) and convinced that I would never get pregnant. Probably painting some room of the house. Seldom covered in miscellaneous food droppings/smearings. 1. FIND BABYSITTER FOR TOMORROW NIGHT'S SOX GAME gaaaah. 2. Finish two freelance jobs. 3. Create database for high school reunion registrations. 5. Write haikus for two upcoming posts. 1. The discontinued, then happily revived, then sadly discontinued White Cheddar Pringles. 2. Girl Scouts Caramel DeLites. 3. My own chocolate chip cookies. 4. Stacy's Parmesan Garlic and Herb pita chips. 1. Give tons of money to my church, Habitat for Humanity, my choir foundation, the Harvard Crimson, the college fund, public radio and television, microfinance groups like Kiva, and so forth. 2. Redo my kitchen and upstairs bathroom. Vile mold, be gone! 3. Buy my husband a BMW. 4. Go shopping and buy things that aren't even on sale. 1. Procrastination (known as "noodling" when it involves the computer). 3. Parking too close to my husband's truck in our driveway. I now tag five people who have commented here in the past, or whose blogs I've commented on in the past. Sarah Miller at Reading, Writing, Musing . . .
Chloe Wood Schuttler Mitchell. May 1, 1995 -- May 16, 2008. 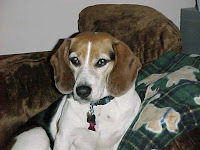 Guileless, fearless, possibly brainless; the sweetest sweetie beagle I've ever known. The house is way too quiet. And the floor is full of dropped food bits. And I won't be reading #53 on The LIST any time soon. I've been tagged for the Meme of Five, which I'll do sometime next week. But not today. If you are in the Boston area and are desperately looking for something nice to do for and/or with your mom this Sunday, why not come hear me sing? 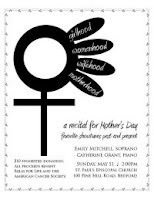 I'll be performing "Girlhood, Womanhood, Wifehood, Motherhood: A Recital for Mother's Day" on Sunday, May 11, at 2:00pm at St. Paul's Episcopal Church in Bedford, MA. The recital features favorite showtunes from past and present, all revolving around common experiences of women everywhere. It's about an hour long and should be a lot of fun. (Provided I don't forget the lyrics.) A freewill offering will be taken, with all proceeds benefiting Relay for Life, a program of the American Cancer Society. If that is not incentive enough, please note that I will be wearing a turquoise, 1950s-era prom dress. Oh, well. I'll just ignore it unless it becomes a real problem. help but fall in love. My Most Excellent Year: A Novel of Love, Mary Poppins, and Fenway Park by Steve Kluger. Dial, 2008, 403 pages. P.S. "Ramon Garciaparra" (p253)? Ahem. a cup of bush tea? The Miracle at Speedy Motors by Alexander McCall Smith. Pantheon, 2008, 224 pages. Waiting for Normal by Leslie Connor. Harper, 2008, 290 pages.